The Byzantine Empire during its greatest territorial extent under Justinian. c. 550. The Byzantine Empire or Eastern Roman Empire (Greek: Βασιλεία Ῥωμαίων, Basileía Rhōmaíōn), also known as Byzantium, was the eastern, Greek-speaking section of the Roman Empire which remained in existence after the fall of the western section in the 5th century AD, centered around its capital of Constantinople. The Byzantine period is usually considered to span from 395 to 1453 AD. The actual term Byzantine Empire is an invention of historians: its inhabitants considered it to be a continuation of the Roman Empire and themselves to be Romans. 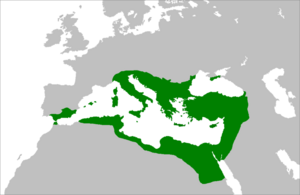 The Empire is also known as the Eastern Roman Empire although this name is more commonly used when referring to the time before the fall of the Western Roman Empire. During much of its history it was known to many of its Western contemporaries as the Empire of the Greeks because of the dominance of Greek language, culture and population though, Latin remained the official language until the 7th century. To its inhabitants and neighbors, the Empire was simply referred to as the Roman Empire (Greek: Βασιλεία Ῥωμαίων, Basileía Rhōmaíōn) or Romania (Greek: Ῥωμανία, Rhōmanía) and its emperors continued the unbroken succession of Roman emperors. In the Islamic world it was known primarily as روم (Rûm). This page was last modified on 6 August 2014, at 21:48.